Collaborators’ Q&A: What inspires you in this poem? 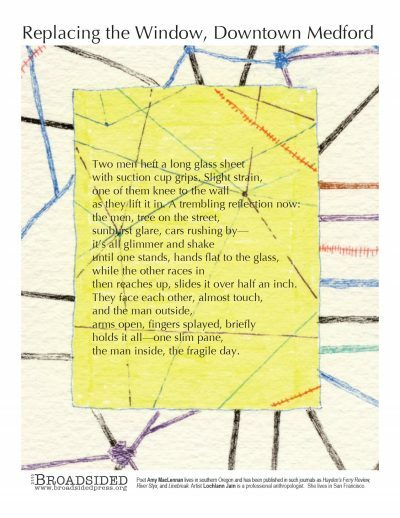 Artist Løchlann Jain: I love the play of surfaces in the poem, and the literal and figurative slippages in how and what can be gripped and grasped. What did you think an artist would pick up on from your poem? Poet Amy MacLennan: I expected a sense of duality or mirroring from the poem. A sense of reflection. Collaborators: Poet Amy MacLennan‘s poems appear in the anthologies Eating Her Wedding Dress: A Collection of Clothing Poems from Ragged Sky Press and Not a Muse: The Inner Lives of Women from Haven Books. Artist Løchlann Jain is a professional anthropologist.